The Entrepreneurship Summit is a two-day event for entrepreneur alumni and aspiring entrepreneur students to network and learn from one another. It is hosted annually by the J. Lawrence Connolly Center for Entrepreneurship. The event launched in 2012 and has been attracting more students and alumni ever since. This year’s keynote speakers were Ben Johns ’78, founder and CEO of SCOUT Bags, and Warren Stephens ’79, chairman, president, and CEO of Stephens Inc.
Over 120 alumni and over 250 students attended this year’s Summit, which took place September 29-30, 2017. Jeff Shay, the Johnson Professor of Entrepreneurship and Leadership, founded and leads the Summit. The following is his take on this year’s Summit. Question: Why did you start the Entrepreneurship Summit? Answer: We started the summit because I had gone on the road and met dozens of alumni eager to connect with other alumni and were in search of a reason to return to Washington and Lee. We wanted to create an event that catered to both alumni and students. This event is centered on entrepreneurship and run like a professional conference. Alumni of different experience levels and backgrounds come and share their stories. The key to the creation of this event was to make sure that alumni gain value from it so they keep coming back. Question: What was successful about this year’s Summit? Answer: The real success and credit of this year’s Summit goes to the alumni who prepared great sessions and the Venture Club for their hard work setting up this event. Alumni prepared a tremendous amount to make this the best experience for everyone and it shows in the great keynotes and panels we had. The attendance this year was very high and you could see alumni and students making connections. I received a ton of emails with positive feedback- I can’t keep up with them! Question: What is your favorite part about the Summit? Answer: My favorite part of the Summit is walking around and seeing these entrepreneurs and aspiring entrepreneurs engage with one another, share their ideas, learn from each other and even offer to mentor one another. Watching these alumni and students be brought together kind of makes me feel like a combination of the Wizard of Oz and a matchmaker. It’s so fulfilling to observe people intensely engaged in conversation or even laughing with each other. Question: What do you hope to see for the Summit in the future? Answer: I hope to see more people spread the word about the Summit. Every year I get positive feedback and people who come up to me and say “I didn’t even know this was happening” and I just want the word to keep spreading. It’s a great opportunity for people- you receive this professional conference; you have people who have this shared W&L experience combined with a shared passion for entrepreneurship and they get connected at the Summit. I want to continue this connection and see attendance to continue its growth in the future. 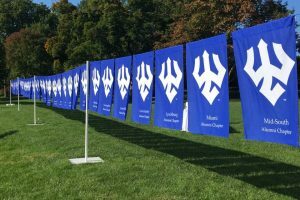 Matthew Rickert ’18 who is the Events Director for the Venture Club, the organization responsible for a great deal of the Entrepreneurship Summit execution, talked to us about the hard work that went into setting up the Summit. Question: Why did you join the Venture Club? Answer: I was inspired to join the Venture Club because my dad was an entrepreneur, so it was an interesting way to get involved in the family business and have discussions on what it means to be an entrepreneur. It’s also an interesting topic that aligns with the classes I’ve taken in the C-School from accounting, to marketing, to business, etc. Question: Can you describe the amount of work that went into the Summit? Answer: My main responsibilities included a lot of emailing and communications work. We broke up the Venture Club into six different committees and had them each work on a different part of the Summit. Some people were constantly trying to get Venture Club members to volunteer for shifts, some people were setting up sessions leaders, some emailing alumni, planning the sessions structures, or working with the Events and Communications team from the C-School. Event preparation took from March 2017 until the very end of the event on Saturday, September 30. Students worked all summer. They would get out of their internships then get right into conference calls with alumni to work on the extensive planning. Matthew guessed that he put in around 250 hours of work into the Summit. Question: What was the most fulfilling part of this year’s Summit? Answer: Coming to the end and realizing nothing fell apart! And the Summit will continue to reward us when students apply for the Venture Club because they had a great experience at the Summit. To learn more about joining the Venture Club there will be an info session on Tuesday, October 24th from 6:15-7 in Stackhouse Theatre. Venture Club application due date: November 3rd at 5 pm. Answer: From an operations standpoint, getting as many people to attend and check in smoothly was successful. From an educational standpoint, I think this year the student pitch went especially well. The Student Pitch Competition, which takes place each year at the Entrepreneurship Summit, is open to all W&L undergraduates and provides students with the opportunity to practice presenting a business idea in front of a large audience of students, faculty, staff and over 100 alumni. Answer: Ideally I would like to see more students getting involved and more interaction between students and alumni. Save the date for the seventh annual Summit, to be held in Lexington September 21-22, 2018!